We have a bright new group of dotted cottons in the store. These tone-on-tone prints have a distressed element in the design, with shading and rough effects that make them a little more interesting than your average polka dot! These would make perfect blenders in quilts. Use them as an alternative to solids for a more dynamic look! These abstract cotton prints have both a geometric quality and a soft, watercolor-like feel. The border-print cityscape below is at once abstract and highly realistic. The companion print is a gorgeous wash of color. Use each alone or pair the two together for striking effects! Sue made this jacket from a heavy textured cotton with a bold floral print. The loose cut and shorter sleeves make it a perfect summer piece - just right for unexpected chilly days or moving in and out od air conditioning! Sue used the Sewing Workshop West End Top pattern. Sewing Workshop patterns have a unique style, often using color blocking and asymmetry, with a fit that's generous but still well-proportioned. Sue says she plans to wear this simply with jeans to dress up her everyday outfits! I think it would also make a stylish swim cover-up. We have a few new ITY knits in the store! Interlock Twist Yarn knits, or ITYs, are a type of jersey created by a unique twist process that gives the fabric a wonderful weight and slinky drape. Made from a poly/spandex blend, ITY knits often come in bold, bright prints to really make a statement! Stitched by Robert Kaufman is a new line of soft cottons that are woven with small stripes to mimic running stitches. The look evokes Sashiko embroidery. These border-oriented fabrics have a ombre-like shading; the stitches slowly transition from small and dense at one end to larger and more open at the other. Here's a detail shot of the tiny stitched texture. These fabrics are soft enough for wonderfully comfortable shirts or blouses. Take full advantage of the gradient stripes with a dress, or incorporate them into a modern quilt! We have a new denim knit! This 100% cotton, dark indigo knit is actually a French Terry weave, making it super soft and wonderful to the touch. This extra-wide fabric (70" across!) is ideal for slim leggings or soft pants that look like jeans. It would also be great for dresses, tops, and jackets! Here's the reverse side showing the looped French Terry texture against the smooth jersey look of the right side. Are you sewing with our gorgeous linen this summer? Linen is cool, comfortable, and easy-care. Here are some beautiful linens to inspire you! That Rebecca has been at it again! She's applied her signature touch to a new Halloween-themed panel print, making a group of fantastic embellished pillows. I don't know about you, but I would use these all year long. Rebecca backed these pillows with lush velvet (from her stash!) and added sew-on rhinestones and embroidery to the unmasked lady panel. Rick-rack and cording edges these spooky creature pillows. Wool Gathering Event at Treadle! Wool Gathering Company is in the business of all things hand-made. Whether its a hand-carved comb, a hand-loomed scarf or a hand-painted box, we love them all equally. We work with talented artisans who are holding on to exquisite craft forms dating back centuries. Did you know that the British colonialists came to India for the spices, but stayed for the textiles? Seriously, if you have never felt the touch of hand-loomed cotton on your skin, you've missed out. 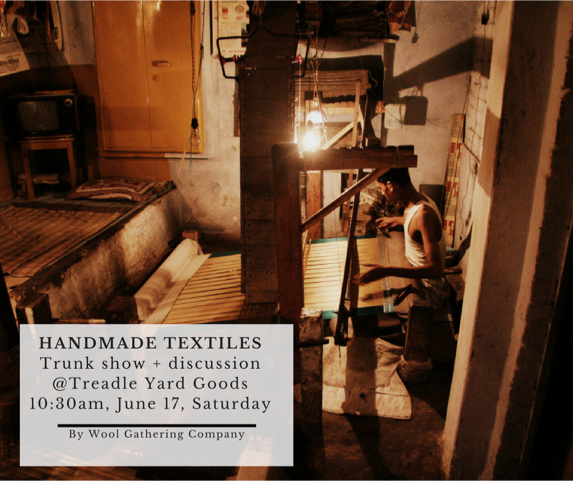 Join us Saturday, June 17 at 10:30 a.m. for this trunk show and discussion. We will focus on the hand-printed, the hand-loomed, and the hand-embroidered textiles from all over India. Please prepare to be pleasantly surprised! Check out this quilt we currently have displayed in the store. The fabric panel features cold-climate animals such as penguins, polar bears, and moose, all wrapped up in adorable scarves and hats! Treadlette Jennifer made this whole-cloth quilt by simply using the fabric panel as-is (no piecing!) and hand-quilting along the print's lines with embroidery floss. Coordinating prints make the colorful binding. It's just about too cute to bear! Perfect for a lap or crib. Made from coordinating 2-inch strips sewn end-to-end, this quilt is simple, fresh, and modern. In this class, you'll construct your entire quilt top and learn about ways to quilt and finish it. A great instant gratification project or confidence builder for budding quilters! Pre-cut your strips in advance to maximize your sewing time! To sign up for this class or any of our classes, call us at (651)698-9690 or stop by the store. Summer is here and these new shirtings are just what you need! Don't feel boxed in by the term "shirting." Though they are perfect for shirts, naturally, these 100% cotton fabrics also make lovely and comfortable dresses, skirts, blouses, and summer pajamas. Summer Sewing should be simple. Easy to make, and easy to wear. A few basic patterns you can make again and again in pretty fabrics. That's what our Simple Summer Blouses class is all about! In this 2-session class starting June 24, you'll make your perfect summer blouse! 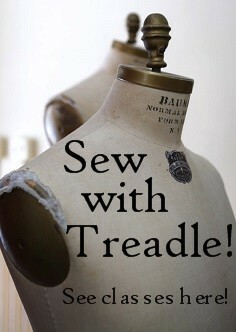 Ideal for the advanced beginner or for the experienced sewist who just wants to take life easy. You'll get a list of recommended patterns to choose from; no fussy details, just cool, comfy blouses and tops and the best, easiest construction techniques. Pair your pattern with a soft cotton lawn or shirting and you'll be sipping lemonade in the shade in no time! The pattern used for the blouse above is New Look 6513, a cute popover top with tucks and hidden bust shaping. New Look 6086, a tunic and tank with a great shape and a flattering side bust dart. And finally, Colette Jasmine. This cute tie-neck top from independent pattern company Colette has a cute shape and great fit. You can find all the recommended patterns on the supply list for this class! Just ask us! We have some new Cuddle fabric prints in the store. These fluffy-soft, machine-washable fabrics are great for baby blankets! We have a great selection of cool cotton lawn in the store. Here are a few of the newest highlights! These modern tulips are fresh for summer dresses! This blue floral has an elegant wide border print. Add some lovely new summer garments to your wardrobe! Sometimes you just want a whole ensemble that goes together like a well thought out plan. This ensemble made by Treadlette Rebecca definitely does! She used a trio of Burda patterns to make the outfit: 6800 for the jacket, 6911 for the knit top with cute twist detail, and 6506 for the knit skirt. Rebecca used a microtex needle for the dense, textured white knit. Her fabulous zippers came from gstorela on ebay. She recommends them!